The Latin American gaming industry continues to grow very well, thank you! But do you know how your company can benefit from it? 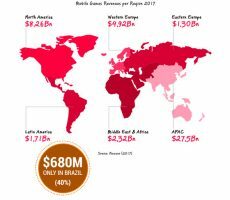 Concentrating about 40% of the region’s market, Brazil (thirteenth in revenue ranking according to this link here from Newzoo: https://newzoo.com/insights/rankings/top-100-countries-by-game-revenues/) offers several investment opportunities in the sector. Of continental dimensions, the country is deeply culturally rich. Thus, this is reflected in its multicultural production of games and in the interests of its audience. Total sales of video games in Latin America are expected to exceed $ 2.7 billion by 2019, Consequently, it offers a number of advertising opportunities. For example, in-game ads that speak directly to a public who is accustomed (and eager) to news and who are willing to spread content that, in a way, represents them. Mobile games, for example, already have an annual growth of more than 60% (as raised in the Latin American World Economic Forum), higher than in all other markets. Thus reaching a layer of the population not commonly associated with video games, but that invests money and attention in mobile games. Knowing this scenario and recognizing the good momentum can provide unique opportunities for interaction with an audience that plays content with great excitement. The Brasil Game Show, the largest fair in the segment in Latin America and one of the largest in the world, is the ideal environment for companies that are not from this area. It is an event conducive to making the brand known in the segment and where they can contact important market players.